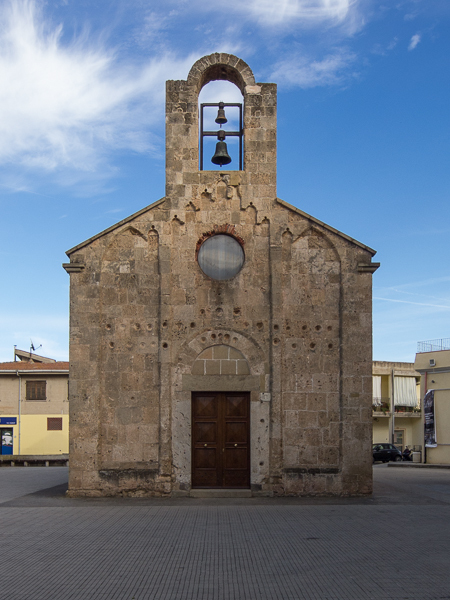 The Romanesque St. Peter’schurch (San Pietro in Italian) was probably built in the 13th century and it is situated in the centre of the village of Villa San Pietro, (that takes its name from this old church), at the foot of Mount Punta Sa Crèsia, along the SS 195. 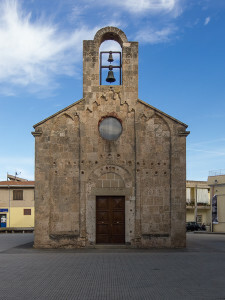 During the Middle Ages, the settlement of Villa San Pietro was annexed to the Giudicàto of Càgliari, one of the four Sardinian independent and indigenous kingdoms (literally: judgeships or judicatures) with the name of “San Pietro” and became part of the administrative district of Nòra. The church is built with limestone. The facade has a big rose window and it is divided into three parts by protruding pillars with decorative arches that follow the roof line. On the top, there is a large bell gable, which is a section of wall with an opening that houses the bell. On the left side, at about 18 ft (5.5 m) from the facade, there is a second portal with a stone lintel with two sculputes: a cross and a male figure probably representing a Pagan God. On the right side at about 8 ft (2.5 m) from the apse there is a third entrance that was the access to the now demolished church premises. The church has a single hall covered of wood. The roof rests on three arches supported by pillars that protrude from the wall. On the sides, at about 8 ft (2.5 m) from the main entrance, there are two windows facing each another. Near the altar there are two other windows, the one on the right currently walled. The church is situated in the city centre. When arrived in Villa San Pietro, go through Viale Cagliari in west direction and proceed along Via Roma. For about 90 m (295 ft), turn left into a square called Piazza San Pietro. The church is on the right side, just in the centre of the square. A paved even car park for disabled is situated in the same square, just in front of the church.